NOTE: The following Information contains an Alternative Healing Method that has been found to be EFFECTIVE in HELPING the Body to RELIEVE Pain. 1. See the PHOTON TORCH™ - Operating Instructions for BASIC Operation. 2a. Shine the SOLID/CONTINUOUS RED Light Beam about 1/4" above and about 1/2" from the MAJOR PAIN POINT No. 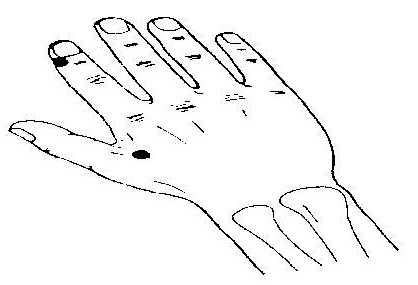 1 (see below) on the OPPOSITE Hand from the AREA of PAIN. Now circle the SOLID/CONTINUOUS RED Light Beam clockwise around, into and then place onto the MAJOR PAIN POINT No. 1 (see below). NOTE: Do this EXPERIMENTAL Biophoton Light Therapy Treatment for 2-5 mins. - 2 times per day. If using MAJOR PAIN POINT No. 1 isn't EFFECTIVE, then place your PHOTON TORCH™ onto the MAJOR PAIN POINT No. 2 (see below). 2b. And/or "paint" the Pain Area with the SOLID/CONTINUOUS RED Light Beam. NOTE: Do this EXPERIMENTAL Biophoton Light Therapy Treatment for 5-10 mins. - 2-3 times per day. 3. Push the Black Rubber Button on the case 'IN' again to turn your PHOTON TORCH™ "OFF". 4. Continue your EXPERIMENTAL Biophoton Light Therapy Treatments until you have obtained the DESIRED healing results. NOTE: If you have NOT, then obtain and use the PHOTON TORCH™ with a BLUE L.E.D. or obtain and use the PHOTON TORCH IR™ with an INFRARED L.E.D..